It’s the birth that sparked an outcry around the world. “Dolphin-Assisted Childbirth Is a Bad Idea,” “Your Midwife Really, Really Shouldn’t Be a Dolphin” and “Woman Plans to Have Baby in Ocean Despite Shark Warnings,” the headlines read. They were all talking about Dorina Rosin and the birth of her daughter, Moana Hoku. Based on the reports, it did, admittedly, seem like an odd and perhaps dangerous way to have a baby. Claims, based on a trailer for a show they filmed called Katie Piper’s Extraordinary Births, were made that they wanted their child to “speak dolphin” and that dolphins would serve as their midwives. Really? No, not really, according to Dorina and her husband, Maika, who have watched the reality of the situation distorted, twisted and flat out fabricated. “We never said anywhere or to anyone that we were planning on having a birth in the water with dolphins,” Maika told SheKnows. The real story is one of dolphin-loving parents who quite simply planned a lovely, peaceful birth for their child. The most dangerous predators around were those in the media trying to sensationalize their story. The birth was never intended to take place in the ocean. 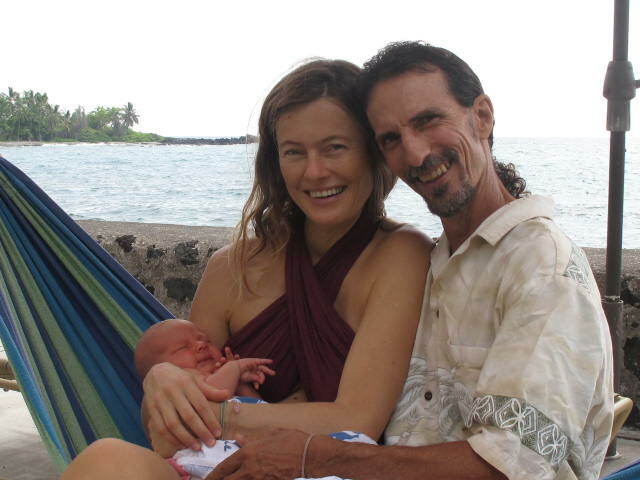 Instead, the couple, who lives on Hawaii’s Big Island and run a spiritual healing center there, planned a home birth in their yard, which overlooks the ocean. While she planned to use a birthing pool, when it came time, Dorina just couldn’t get comfortable in it. So last month she gave birth peacefully by candlelight on the grass in the darkness of night. So where did the dolphins come into play? Dorina says swimming with the dolphins was one of the reasons she believes she had a peaceful, healthy birth, but it was far from the only reason. In addition, she did everything she could that felt right to keep her body healthy while pregnant — sound healing, massage, osteopathy and emotional trauma work — and she had a great deal of support, including “an amazing and spiritual” midwife. “It for sure was an amazing blessing to have a beautiful and natural birth,” she said. So what can other women learn from her experience? So while truth is often stranger than fiction, in this case the truth is simply that of one family doing what they believe is for them and wanting to empower other women to trust their ability to give birth naturally and gently in the most beautiful of ways. No dolphin midwives necessary.